NYC is Blue: NY Times: "New York City F.C. Coach Learning Manchester Way"
NY Times: "New York City F.C. Coach Learning Manchester Way"
BARCELONA, Spain — Jason Kreis is a coach by trade, but for now, he has enrolled in a kind of soccer boot camp in Manchester, England. Kreis moved there with his family in January for a six-month stay while he immerses himself in all things Manchester City. 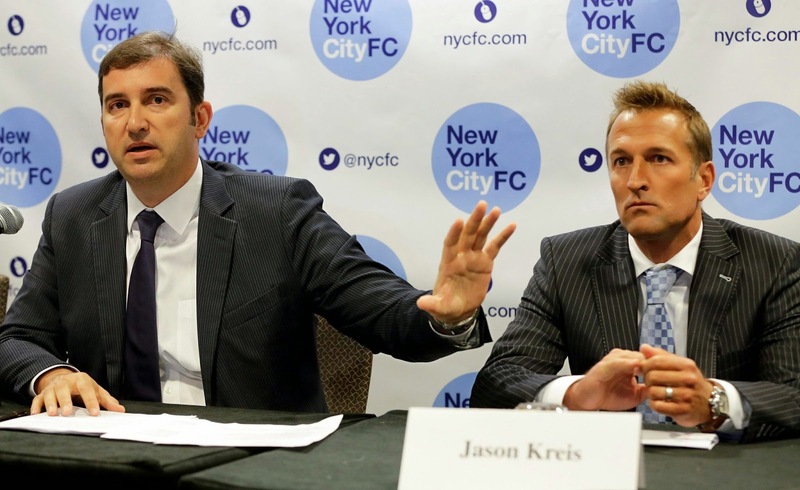 City, along with the Yankees, will operate the new club Kreis will coach, New York City F.C., when it begins play in Major League Soccer next season. The intense, square-jawed Kreis was persuaded by Manchester City last year to leave the relative security of Salt Lake City, where he had coached Real Salt Lake since 2007, for the challenge that awaits him in New York. In an interview last week in Barcelona, where he had gone to watch Manchester City play in the Champions League, Kreis pointed out that his new job came with immense expectations — not only from City’s deep-pocketed owners and N.Y.C.F.C.’s fans, but also from Kreis’s peers and potential players. “I think we’re still fighting for respect in the soccer world; it’s just the way it is,” Kreis said of the perception in England of M.L.S. and soccer in America. “I’d be lying if I said I’ve come over here and that I’ve been getting a fantastic reception about American soccer from everyone. They do think we’re really, really far behind. Some people think soccer in the U.S. is archaic. A former M.L.S. most valuable player, Kreis helped build a championship team at Real Salt Lake with a mix of hungry, young American players like Kyle Beckerman, Tony Beltran, Chris Wingert, Nick Rimando and Luis Gil; and modestly priced imports, mostly from South America, including Jamison Olave (now with the Red Bulls), Alvario Saborio and Joao Plata. In Manchester, Kreis has spent most of his time watching City’s youth players. He said M.L.S. and Manchester City had an agreement that would enable him to acquire up to four players on loan from City’s under-21 academy team. “No, I can’t take Fernandinho on loan for N.Y.C.,” he said of one of City’s Brazilian stars. “I’ve been looking at the U21 squad intently to see if there are a few who could be useful for N.Y.C., and the answer is, there are. The decision for each Manchester City team in the club to play with the same style “comes from top down,” Kreis said. The philosophy provides continuity as players develop, he added, but also a consistent mind-set that Kreis says is missing in the United States. With less than a year until N.Y.C.F.C. begins play, Kreis described himself as impatient. He called himself “a worrier” intent on waiting for this summer’s international transfer period to make some core acquisitions that he then can augment through the M.L.S. expansion draft and the next college draft. Perhaps not surprisingly for someone now employed by one of the world’s richest clubs, Kreis was particularly adamant about the need for M.L.S. to loosen the purse strings and increase salary budgets. He complained that the current restrictions leave clubs with little depth. Last week’s trip to Barcelona was Kreis’s first outside England since taking his new post. It was not, he said, a vacation. It's great to see some attention from the Gray Lady, and Jack Bell's coverage is second to none. We're getting a peek at how Kreis might be developing his roster. I love the fact that he's scouting lower leagues outside of City's academy. And he's right about the bench depth; you have to figure that the increased expansion fees, and the deeper pockets paying them, will mean raising the salary cap to increase the value of those clubs.